In a great setting in stylish Camps Bay is Sandbar. Simple food, full of flavour and with the best ingredients is on offer at this trendy spot. A great place for a quick bite to eat or lazing with friends. 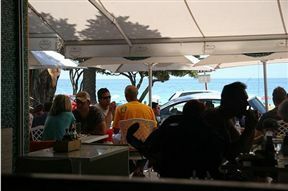 In less favourable weather, the beach-style interior and pleasant views will keep diners entertained. The wine list proffers something for everyone. A buzzing and popular spot, Sandbar is well worth a stop off when visiting Camps Bay’s ‘golden mile’. 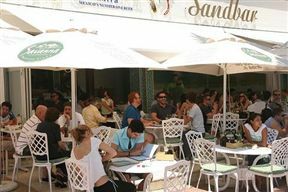 Sandbar is 5.1km from the centre of Cape Town , the nearest airport 24.4km (Cape Town International Airport).